Strain MP5ACTX8T (= ATCC BAA-1857T = DSM 23137T), is the type strain of the species Granulicella mallensis . 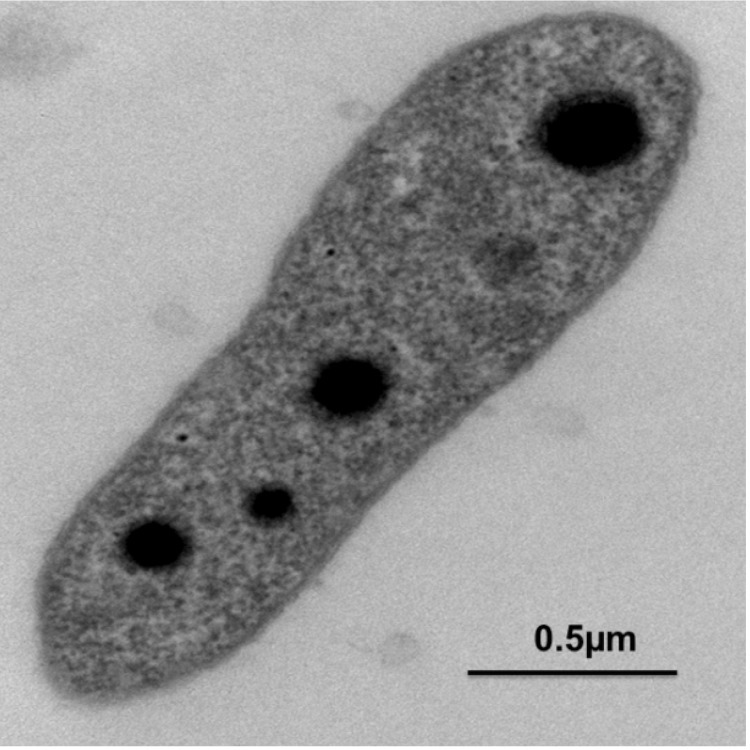 The genus Granulicella, in subdivision 1 of Acidobacteria, was first described by Pankratov et al. in 2010 . Granulicella mallensis (mal.len' sis. N. L. fem. adj. mallensis; pertaining to its isolation from soil of Malla Nature Reserve, Kilpisjärvi, Finland; 69°01’N, 20°50’E) was described along with other species of the genus Granulicella isolated from tundra soil  and is one of the two with sequenced genomes, out of eight validly described Granulicella species. Acidobacteria is one of the most ubiquitous bacterial phyla found in diverse habitats and is abundant in most soil environments [3,4] including Arctic tundra soils [5,6]. Acidobacteria are phylogenetically and physiologically diverse  represented by 26 phylogenetic subdivisions  of which only subdivisions 1, 3, 4, 8, and 10 are defined by taxonomically characterized representatives. To date, subdivision 1 is comprised of eight genera: Acidobacterium , Terriglobus [10,11], Edaphobacter , Granulicella [1,2], Acidipila , Telmatobacter , Acidicapsa  and Bryocella . Subdivision 3, 4 and 10 include only one genus each, namely Bryobacter , Blastocatella  and Thermotomaculum , respectively, while subdivision 8 includes three genera; Holophaga , Geothrix  and Acanthopleuribacter . Three species, ‘Candidatus Koribacter versatilis’ , ‘Candidatus Solibacter usitatus’  and ‘Candidatus Chloracidobacterium thermophilum’  have been described as ‘Candidatus’ taxa. Acidobacteria are relatively difficult to cultivate with slow growth rates and typically require up to several weeks to develop visible colonies on solid media. Nevertheless, the phylogenetic diversity, ubiquity and abundance of this group suggest that they play important ecological roles in soils. The abundance of Acidobacteria has been found to correlate with soil pH [25,26] and carbon [27,28], with subdivision 1 Acidobacteria being most abundant in slightly acidic soils. Our previous studies have shown that Acidobacteria dominate in the acidic tundra heaths of northern Finland [25,29-31]. Using selective isolation techniques we have been able to isolate several slow growing and fastidious strains of Acidobacteria [1,11]. 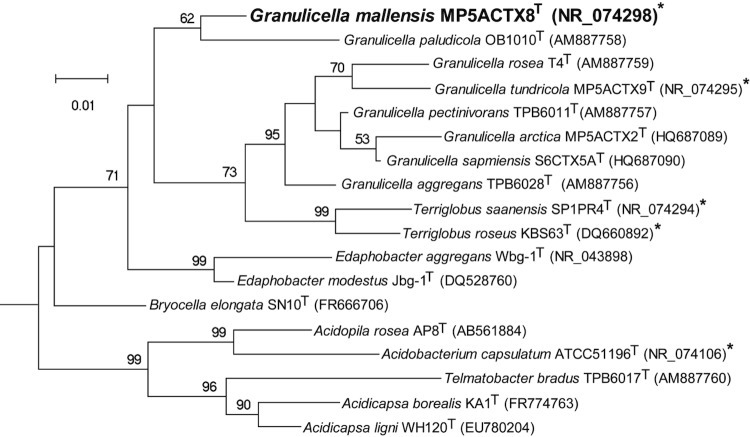 On the basis of phylogenetic, phenotypic and chemotaxonomic data, including 16S rRNA, rpoB gene sequence similarity and DNA–DNA hybridization, strain MP5ACTX8T was classified as a novel species of the genus Granulicella . 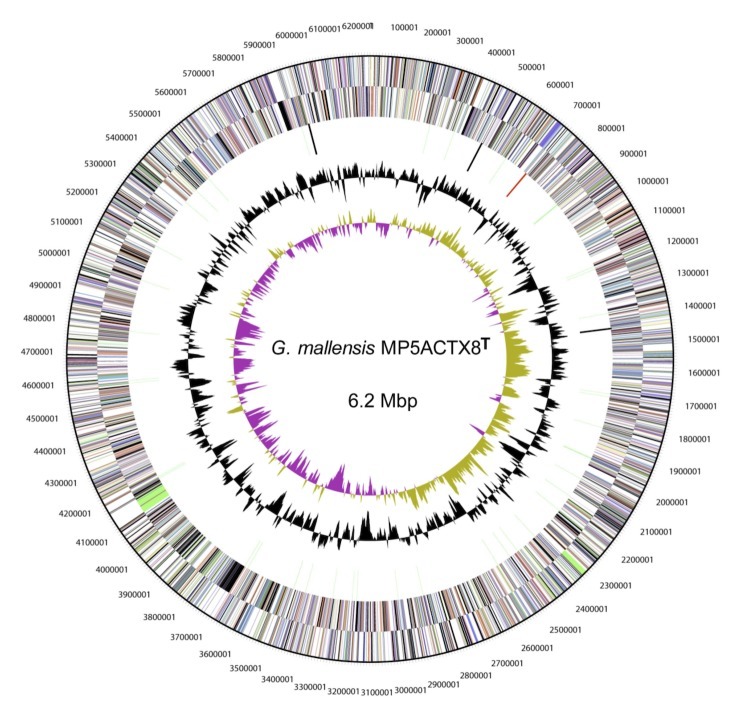 Here, we summarize the physiological features together with the complete genome sequence, annotation and data analysis of Granulicella mallensis MP5ACTX8T (Table 1). Within the genus Granulicella, eight species are described with validly published names: G. mallensis MP5ACTX8T, G. tundricola MP5ACTX9T, G. arctica MP5ACTX2T and G. sapmiensis S6CTX5AT isolated from Arctic tundra soil  and G. paludicola OB1010T, G. pectinivorans TPB6011T, G. rosea TPO1014T and G. aggregans TPB6028T isolated from sphagnum peat bogs . Strain MP5ACTX8T showed 95.5 -96.1% 16S rRNA gene sequence identity to tundra soil strains, G. tundricola MP5ACTX9T (95.5%), G. sapmiensis S6CTX5AT (96.2%) and G. arctica MP5ACTX2T (96.1%) and 94.6 – 97.4% to G. rosea TPO1014T (94.6%), G. aggregans TPB6028T (96.0%), G. pectinivorans TPB6011T (96.1%), G. paludicola OB1010T (96.5%) and G. paludicola LCBR1 (97.4%). Phylogenetic analysis based on the 16S rRNA gene of taxonomically classified strains of family Acidobacteriaceae placed G. paludicola type strain OB1010 T as the closest taxonomically classified relative of G. mallensis MP5ACTX8T (Figure 1). G. mallensis utilizes D-glucose, maltose, cellobiose, D-fructose, D-galactose, lactose, lactulose, D-mannose, D-ribose, raffinose, sucrose, trehalose, D-xylose, N-acetyl-D-glucosamine, glucuronate, glutamate, melezitose and salicin, but does not utilize D-arabinose, acetate, formate, pyruvate, malate, mannitol, D- or L-alanine, D-glycine, L-leucine, L-ornithine, gluconic acid, aspartate, dulcitol, butyrate, caproate, valerate, lactate, oxalate, propionate, fumarate, adonitol, methanol, ethanol, succinate, D-sorbitol or myoinositol, when grown using VL55 mineral medium with 100 mg yeast extract l-1. G. mallensis hydrolyzes aesculin, starch, pectin, laminarin and lichenan, but not gelatin, cellulose, xylan, sodium alginate, pullulan, chitosan or chitin on R2 medium. Strains show positive reaction for acid and alkaline phosphatases, leucine arylamidase, a-chymotrypsin, naphthol-AS-BI-phosphohydrolase, α- and β-galactosidases, α- and β-glucosidases, N-acetyl- β-glucosaminidase, β-glucuronidase, trypsin and valine arylamidase, but negative for α-fucosidase, α-mannosidase, esterase (C4 and C8), lipase (C14) and cystine arylamidase. Strain MP5ACTX8T reduces nitrate to nitrite. Strain MP5ACTX8T is resistant to the antibiotics erythromycin, chloramphenicol, neomycin, rifampicin, streptomycin, gentamicin, polymyxin B and penicillin, but susceptible to ampicillin, kanamycin, tetracycline, lincomycin, novobiocin and bacitracin . Thrash JC, Coates JD. Phylum XVII. Acidobacteria phyl. nov. In: Krieg NR, Staley JT, Brown DR, Hedlund BP, Paster BJ, Ward NL, Ludwig W, Whitman WB (eds), Bergey's Manual of Systematic Bacteriology, Second Edition, Volume 4, Springer, New York, 2011, p. 725. Thrash JC, Coates JD. Family I. Acidobacteriaceae fam. nov. In: Krieg NR, Staley JT, Brown DR, Hedlund BP, Paster BJ, Ward NL, Ludwig W, Whitman WB (eds), Bergey's Manual of Systematic Bacteriology, Second Edition, Volume 4, Springer, New York, 2011, p. 728. Han CS, Chain P. Finishing repeat regions automatically with Dupfinisher CSREA Press. In: Arabnia AR, Valafar H, editors. Proceedings of the 2006 international conference on bioinformatics & computational biology; 2006; June 26-29. CSREA Press. p 141-146.